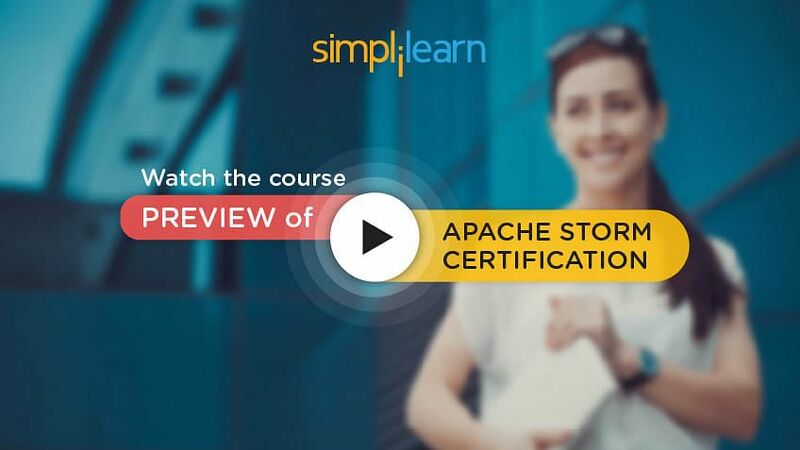 Welcome to the third chapter of the Apache Storm tutorial (part of the Apache Storm course). This chapter will help you get familiarized the steps for installation and configuration of Storm. Now, let us start with exploring the objectives of this lesson. Describe the steps to set up a multi-node Storm cluster. Moving on, let us discuss the Storm versions. Following are the steps involved in installation and configuration of apache storm. Storm has multiple versions. You need first to choose the latest stable version for installation. Zookeeper is a prerequisite to run Storm on the system. So, you start by installing zookeeper. Since Zookeeper comes as a part of Kafka and you will learn about Kafka interface to Strom later in the lesson, let us start by installing Kafka before installing Storm. Version 0.8.2 is the current stable version of Kafka and the current stable version of Storm is Version 0.9.5. Next, let us look at selecting the right Operating System. You can choose any of the Linux operating systems for installation. Ubuntu 12.04 or later – Installed on our virtual machine is a good choice. You can also choose other Linux systems like Red Hat Enterprise Linux (referred to as RHEL) or CentOS (Free version of RHEL) or Debian systems. Storm needs a good memory and adequate processing power. Below are the recommended machine configurations. Processors which are 2GHz or more. Next, let us look at how to prepare the machine for installation. Following are the prerequisite software for installing Storm. Now, let us look at the steps to download the software. Do this on each machine where Zookeeper has to be installed. The file with .tgz or .tar.gz extension is called tarball. Tarball is a compressed tar archive on Linux. Next, let us learn how to download Storm. Do this on each machine where Storm has to be installed. Now, we will learn how to install Kafka. After the download, the archives have to be unzipped and moved to the proper location. Note that sudo may ask for the password. Now that Kafka is installed, let us install Storm. Next, let us set up a path for Kafka and Storm. Note that all the above commands are case sensitive, so you need to type exactly as shown. Restart bash for changes to take effect as shown below: exec bash This will set up the path to include the Kafka and Storm directory. Moving on, let us see how to configure memory settings. Some development systems have low memory, so by default heap memory settings will not work on them. Change the directory to bin directory of kafka installation. Next, edit the zookeeper-server-start.sh file using vi editor. You can use i to enter the insert mode in vi and escape to get out of the insert mode. (Escape key is normally located at the top left corner of the keyboard) vi zookeeper-server-start.sh. export KAFKA_HEAP_OPTS="-Xmx512M -Xms512M" with export KAFKA_HEAP_OPTS="-Xmx64M -Xms64M"
Press escape and save the file with :wq. Next, edit the Kafka-server-start.sh file using vi.Kafka-server-start.sh. export KAFKA_HEAP_OPTS="-Xmx1G -Xms1G" with export KAFKA_HEAP_OPTS="-Xmx128M -Xms128M"
Now, let us look at how to configure zookeeper for Storm. Since Storm uses zookeeper for distributed coordination, you need to configure zookeeper to work with Kafka. Next, let us learn how to configure Kafka. The changes given below are required for Kafka configuration. Check that the default port is set to 9092: port=9092. Check that zookeeper is set to connect at port 2081: zookeeper.connect=localhost:2181. If you have multiple zookeeper instances, you can specify them as mentioned above, separated by commas. Now, you will learn to modify some more Kafka properties. Few more changes are to be done on the server.properties file. Moving on, you will learn how to start the Kafka server. Enter the Simplilearn password, if asked for a password. Note that sudo is used so that you have proper permissions. The & (ampersand) is added at the end so that the process runs in the background. For background processes, nohup is added in the beginning so that the background process does not end, even if your session is terminated. The standard output from the server is sent to /tmp/zk.out file and the standard error is sent to /tmp/zk.err file with the 2> option. sudo and nohup are used here in the same way as explained in the previous command. Next, let us look at creating directories for Storm. As you have learned how to install Storm and create the directories for Storm. Next, you will learn how to configure Storm. Given here are the changes required for Storm configuration. Edit the storm.yaml file using the command: vi storm.yaml. Specify the address of the nimbus host: nimbus.host: “nimbus1” Change nimbus1 to the IP address of the machine. Now, you will configure the storm memory parameters. Continue modifying the same file to specify the memory for Java processes, you can start with 128MB for all the processes. Add the lines mentioned below. If the lines already exist, modify to change the numbers. Specify the data directory for Storm. Press escape and save the storm.yaml file with :wq. Next, let us look at starting the Storm servers. Let us start the Storm nimbus and supervisor servers. You will also need to start the Storm UI to monitor through a web interface. Start the Storm UI for monitoring; you can check this at port 8080 using your favourite browser. Next, let us run a sample Storm program. Here, you will run a sample program created by Simplilearn that processes the logfile. Next, let us check the output of the sample Storm program. The output of the sample program is in /tmp/stormoutput.txt directory. You can check the content of this file with the command: cat /tmp/stormoutput.txt. Note that the actual output might be different in your case. Next, let us check the Storm UI. You can check the storm processes using Storm UI at port 8080. Use your browser (Firefox or Chrome) and IP_address:8080, where IP_address will be the IP address of your virtual machine. The diagram shows the Storm UI from the browser at port 8080. It shows the cluster summary, topology summary, supervisor summary as well as Nimbus server configuration parameters. You can see that the topology test1 is currently running. Now, you will learn how to stop the Storm topology. You can stop the running storm topology with the help of the following command: storm kill test1 Verify that the topology is not running with storm list. Let us now check the log files. vi can be used to check the content of the log files. First, install Kafka and Storm on each machine as discussed earlier. That is, download the Kafka and Storm tarballs, unzip the compressed archive and move the expanded directory to /usr/local/Kafka and /usr/local/storm respectively. This has to be done on each of the three nodes. Moving on to the second step of setting up multi-node Storm cluster. Note that node1, node2, node3 are the IP addresses of the 3 servers. The third step is to Setup the myid file for zookeeper. Note that the content of myid file is different on each server. Moving on to the fourth step. Specify the address of the nimbus host. Moving on to the fifth step of the set up. Some more changes are made to storm.yaml file. Specify the data directory for storm: storm.local.dir: "/var/lib/storm"
Finally, the last step of the set up is to Start the zookeeper server on each node. This completes the setup of the multi-node Storm cluster. Storm has multiple versions and the latest stable version of Storm is 0.9.5. Kafka installation is used to install zookeeper. Storm can be installed by downloading the latest tarball. After the installation of zookeeper and Storm, both of them need to be configured. Storm command can be used to submit a topology to Storm. To set up a multi-node Storm cluster, a six-stepped process needs to be followed. This concludes the lesson: Introduction to the Installation and Configuration of Storm. In the next lesson, you will learn about the Advanced Storm Concepts.